The classic story is that people are familiar with it , it is deeply rooted in the spread of thousands of years. In the design of jewelry on the choice of different elements, it can express a different emotion. Each product design elements are unique. Falling the different elements into the jewelry design ,Can improve the height of jewelry design. First we are station on the fashion shoulder. starting point on the high , next we let the jewelry design has become a soul, become a life . It is not a cold precious metal and no gems of life .it can tell people about trendy . can impact people the soul of the deepest thing .choose us ,Our Jewelry will give you a unique beauty . let you become a Unique Queen. 20 pairs of different styles, Each one is a different design concept, Has a different meaning, This product includes different series, (animal series), (drill ball series), (leaves series), (love Heart series ), (Flower series), Have it, every day can wear different earrings, Elegant and Bling choose for your lover,Suit for women Girl kids all ages. Let you hold a different beauty every day. DESIGN : 20 pairs of different styles, Each one is a different design concept, Has a different meaning, This product includes different series, (animal series), (drill ball series), (leaves series), (love Heart series ), (Flower series), Have it, every day can wear different earrings, Elegant and Bling choose for your lover,Suit for women Girl kids all ages. Let you hold a different beauty every day. MATERIAL? ?Different Styles Using Different Crafts and Materials?. Shiny Round Cubic Zirconia Inlaid, enamel handmade panted coating, Stainless Steel Ear needle, lead-free & nickle-free, Hypoallergenic,no harm to health. 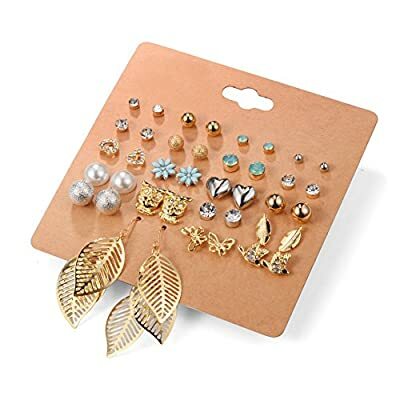 SIZE : One Order Includes 20 Pairs Earrings of Different Sizes and Styles, Economical Jewelry Set for Men and Women.Girls and Kids.